Next month sees the publication of Nicola Barker’s tenth novel, In the Approaches, twenty years on for her first, Reversed Forecast. I’ve been following her career since she was suggested to me by someone I’d never met before (nor would meet again) at the Edinburgh Film Festival in 1999 (I like to think she’d appreciate this as her novels often concern the effect strangers have on each other) but the earliest work I’d read was Wide Open – until now. 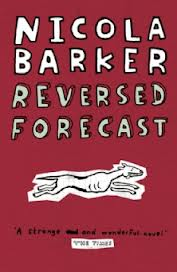 Another chance encounter – with a copy of Reversed Forecast in a charity shop –has changed all that. But Ruby does pay Vincent’s bail money, and soon he is living with her. Ruby has a similar reaction later when someone she can’t remember meeting tries to sell her a racing dog – “She wanted to laugh in his face” – but buys the dog anyway. The novel’s other strand concerns a mother-daughter singing duo, Brera and Sam, and Sam’s sister, Sylvia. Barker indulges in a kind of mock magical realism with Sylvia, who finds birds attracted to her wherever she goes. Unfortunately she is allergic to birds, often ill, and at one point close to death. The other major characters (if we don’t include the dog) are Connor, Sam’s boyfriend for most of the novel, his flatmate, Sarah, and Sam and Brera’s new agent (and Ruby’s ex-boyfriend), Steven. A sizeable cast for a slender novel, but Barker handles them with great dexterity, and at no point did I feel (as you often do with such heavily populated novels), I wish I was reading about another character instead. The characters, however, struggle to achieve this balance. When Sam and Brera finally begin their tour, Sam, the novel’s most confident character, is completely undermined by a man in the audience who will only stare at her breasts: “Life is a terrible violation,” she thinks. However, by the novel’s close she has thrown herself at the outside life, enjoying its every sensation. Reversed Forecast is a reassuringly wonderful first novel (I had perhaps subconsciously avoided it, afraid of disappointment). It’s also a reminder of Barker’s talent that leaves me anticipating June all the more. You are currently browsing the archives for the Nicola Barker category.